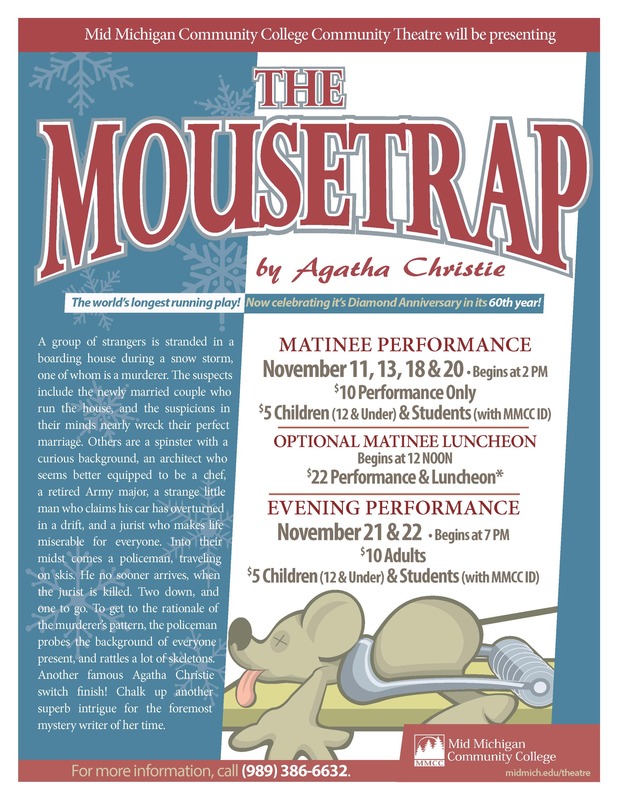 Tickets are still available for the MMCC Theatre production of The Mousetrap by Agatha Christie. The Mousetrap, a murder mystery play, opened in the West End of London in 1952 and has been running continuously since then. It has the longest initial run of any play in history, with its 25,000th performance taking place in 2012. The play is known for its surprise ending, which audiences are traditionally asked to keep secret when they leave the theatre. All performances will take place in MMCC’s Harrison Auditorium at 1375 S Clare Ave. Matinee performances are Nov. 11, 13, 18 and 20 with an optional luncheon at noon and the show at 2 p.m. Prices are $22 for the luncheon and show or $10 for the show only. Luncheon tickets must be purchased in advance. Evening performances are scheduled for Nov. 21 and 22 at 7 p.m. Prices are $10 for adults and $5 for children 12 and under. Tickets can be purchased in the MMCC Bookstore on the Harrison campus. For credit card orders, call (989) 386-6640 from 8 a.m.-6 p.m. Monday through Thursday and 8 a.m. – 3 p.m. on Friday. Tickets will also be on sale at the door.